Two well supported teams scoring their debut wins figured in the voting here: Embassy Racing’s obvious joy after a hard fought race at Knockhill and Keith Ahlers’ Team Aero win in GT3 at Thruxton were a joy for the whole grid, and the whole press room too, as two / three long seasons of trying very hard were finally rewarded. Phil Keen’s pass on Patrick Pearce at Thruxton gets a vote here too, the Eclipse man pulling a fabulous dummy before tucking inside the TVR into the chicane to take the lead of the race. The winner here was the extraordinary climax of a race that had started with the disappointment of a pair of safety car periods, costing the first 30 minutes of a two hour race. It had looked like a washout, but boy did it turn out to be a cracker. With highly changeable conditions, tyre choice was critical and, in GT2, it was Embassy Racing that guessed correctly, with the Porsche going from third to first in two laps, dragging a full 20 seconds back from the lead Ferrari to grab the advantage with just four corners left to run. In GT3 the real drama wasn’t for the win – the Chris Stockton / Andy Britnell Porsche claiming the victory, but there was high drama late on in this class too. 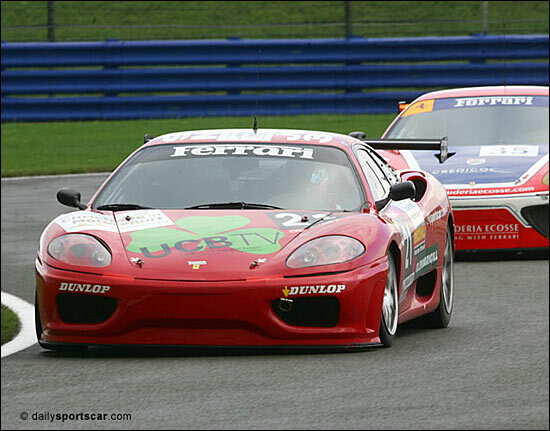 It looked like a Porsche 1-2-3 with Piers Masarati and Steve Wood further back on the same lap. But storming back from a full lap down, after Hector Lester had spun out in the UCB Ferrari, Allan Simonsen was simply astonishing. Yes, he chose the correct tyres for the latter part of the race, but his pace was amazing, at times two seconds faster than the entire field (including the front running GT2 cars). He passed Steve Wood on the penultimate lap, but surely third was as good as it would get? Nope, storming through Woodcote as the finish line approached, he was right on Masarati’s tail: Piers drifted ever so slightly wide on his now entirely shot rubber and Simonsen saw his chance, and a gap. At the finish he grabbed second place by just one thousandth of a second. The dailysportscar.com United Kingdom Moment of the Year 2005 was the last lap of the 2 Hour British GT Race At Silverstone.